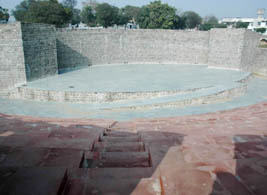 In a judgment that is sure to leave many top officials in the UT Administration red-faced, the Punjab and Haryana High Court today termed the allotment of a prime piece of land in Sector 38-A to Chandigarh Law Institute Private Limited as “arbitrary, unjust, clandestine and illegal” and opposed to Article 14 of the Constitution. A maid allegedly jumped to death from the third floor of the Haryana Environmental and Public Health Officer's Co-operative Group Housing Society, Mansa Devi Complex, in Sector 5, here, this afternoon. While the Chandigarh Police is groping in the dark about the origin of a sleazy MMS, another has come into circulation apparently featuring a city-based student. The growing demand for power and the impact of floods in the last monsoon has forced the Chandigarh Administration to seek more funds under the next year’s Budget to add infrastructure to handle flooding and streamlining the power supply system in the city. With criminalisation of politics and politicisation of crime taking toll on criminal justice system, the newly acquired forensic science knowledge has armed the investigating agencies with latest techniques to deal with ‘VIP’ criminals whom policemen dare not touch. Alleging discrimination in the constitution of committees of the Municipal Corporation of Chandigarh (MCC) by the Mayor, Ms Anu Chatrath, the BJP councillors today decided to resign from the committees. Indian pharmaceutical units have discovered 15 new drug molecules in the past one year. These molecules have been cleared by the Indian Council of Medical Research (ICMR) for the first phase of clinical trials. Girls have far outdone boys in number of medal winners at the 54th annual convocation of Panjab University here today. 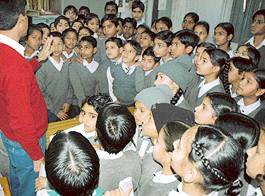 More than 75 per cent of the total 139 medal winners were girls. 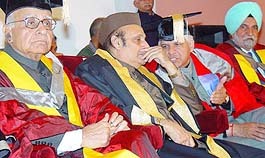 Mr T.N.Chaturvedi, Governor of Karnataka (extreme left), Dr Karan Singh and Mr Ashwani Kumar, both Rajya Sabha MPs and Dr S.S. Johl, Vice-Chairman of the Punjab State Planning Board at a convocation in Chandigarh on Monday. — Tribune photo by Manoj Mahajan. 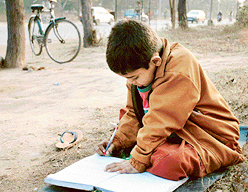 THE spring showers over, the city got ready for a sunny Basant Panchami on Sunday. The festival is symbolised by the flying of colourful kites to mark the end of a harsh winter. 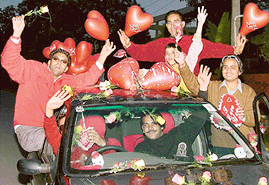 Hundreds of couples, youngsters and the aged celebrated Valentine’s Day with zeal which was unmatched in many senses. Dressed up in their finest clothes, they tried to enjoy every moment of the day. 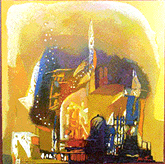 City hotels, pubs discotheques were tastefully decorated. 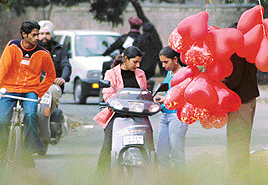 Couples celebrate Valentine’s Day at the Rose Garden in Chandigarh on Monday. It was a unique Valentine’s Day. The Kharar MLA, Mr Bir Devinder Singh, handed over a cheque of Rs 10 lakh to the students of Government Senior Secondary Girls School, Sohana, here today. Students and staff members of Sri Sukhmani Institute of Engineering and Technology celebrated Valentine’s Day here today. 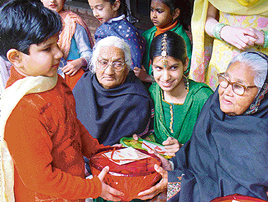 Students of Saupin’s School hand over gifts to inmates of the Old Age Home, Sector 15, Chandigarh, on Monday. This year, spring in Mohali is bound to be special. 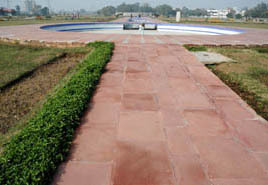 Come March and the much awaited City Park, spread over 18 acres of land in Sector 68 would be thrown open to the public. 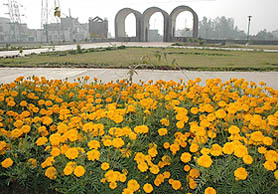 Already blooming with a thousand flowers, the city park is an undertaking of the Punjab Urban Planning and Development Authority (PUDA) and one of its kind in the state. 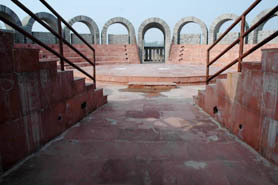 The arched gates at the City Park’s Sector 68 entrance. 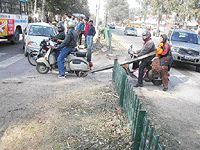 Even after a week of Chandigarh Tribune highlighting the gross violation of traffic rules by motorists at the illegal opening along the Chandigarh-Zirakpur stretch of the Chandigarh-Ambala highway, the authorities concerned have hardly woken up from their slumber. The police has started flashing warning signals to public on the local cable TV network against a shopkeeper in Haripur, Sector 4, who is selling electronic and other household goods at 50 per cent discount. “A major cause of concern for the developing countries was that in view of technological advantages of the developed countries and protection offered under trade-related intellectual property rights (TRIPS), public health issues would be seriously affected as drugs would be monopolized and their prices would rise,” said Dr P. Rama Rao, Director, National Institute of Pharmaceutical Education and Research (NIPER) here today. The SAD (Longowal) will be organising a protest in Ludhiana on February 25 in connection with various issues faced by the state. WITH the bodies of soldiers coming from Jammu and Kashmir regularly, the number of war widows is increasing in the country with every passing day. Navy Queen Sonia Suri (centre) flanked by first runner-up Zaver Shroff (left) and second runner-up Daljit Kaur. The Department of Music, Panjab University, organised a colourful function today in connection with Basant Panchmi. Eminent litterateur, Dr Govindnath Rajguru died of cardiac arrest at Government Medical College and Hospital, Sector 32, last evening. He was 84. Sant Singh Minhas, father of the president of the local unit of the SAD, Mr N.S. 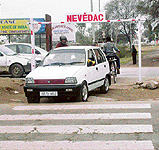 Minhas, died here today due to cardiac arrest. He was 84. The Panchkula Excise Department has seized 500 cases of liquor which were being transported in a Hisar-bound truck. As many as 43 persons moving about in the town under suspicious circumstances were arrested by the police. They were remanded in police custody for one day by the local SDM today. The Crime Branch of the Chandigarh Police has arrested an iron shuttering plates thief who has reportedly admitted to having stolen 32 plates from Sieuj village in Himachal Pradesh and planning to sell them in Chandigarh. Insurance policies, which could be procured from the offices of the insurance companies or the commission agents will now also be available at the counters of various post offices just like stamps and post cards. A stitch in time not only saves nine but can also be a sincere expression of love by women who have through the ages been embroidering dreams on fabric. The Reserve Bank of India (RBI) has clarified that there is no dearth of coins of any denomination and people should not accept other goods in return for the balance amount due to them, says press note. Embarrassment was writ large on the face of Poornima when she went to get her prize at the 54th annual convocation of Panjab University here today. Never-say-die spirit always emerges victorious, they say. And physically challenged Ram Sharma (75) who retired as Deputy Director, Archeological Survey of India, New Delhi, in 1988, has reinforced our faith in the adage. 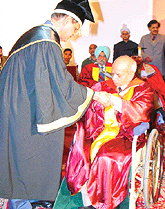 In a wheelchair for the past six months, he is a proud recipient of D. Litt in Arts which he received today at 54th annual convocation, Panjab University, Chandigarh. Teachers from the UK visited the city under the Teachers International Professional Development Programme and were impressed by the discipline in KB DAV Centenary Public School, Sector 7, here today. Mr Vijay Gupta took over as the Director of Punjab Engineering College today. He said he was not aware of the controversies surrounding the college. 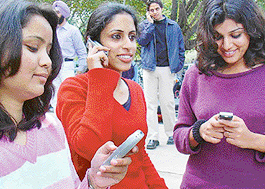 Projecting a positive attitude, he said some fruitful changes would take place in the college. A delegation from Bhutan led by Mr Lyonpo Thinley Gyamtsho, Minister of Education, met the Vice-Chancellor, Prof K.N. Pathak, here today. The alleged immigration fraud involving the organising secretary of the Punjab Pradesh Congress Seva Dal, Harbans Kaur, and her son, Sandeep Singh, seems to be assuming alarming proportions with fresh complaints pouring in against the accused. The Chief Judicial Magistrate (CJM), Mr Gulab Singh, has directed the police to investigate a case of cheating against a Zirakpur-based property dealer. The Chief Judicial Magistrate (CJM), Mr Gulab Singh, today directed the DSP, Panchkula, to investigate a case of assault against two police constables. Gone are the days when the famed couplet of the ultimate in love by Jigar Moradabadi — Yeh ishq nahin aasan bas itna samajh leeje, Ik aag ka dariya hai aur doob ke jaana hai—could set young hearts aflame. The 'Oil on Canvass'— an exhibition of paintings by reputed artist Somenath Maity from Kolkata was opened today at the Art Folio, the Centre for Arts, Sector 9, Chandigarh. A two-day symposium on the emergence of molecular medicine started today at the Department of Biotechnology auditorium. Prof N.K. Ganguli, Director-General, ICMR, New Delhi, inaugurated the symposium. The exclusion of cricket from the 2006 Asian Games, to be held in Doha (Qatar), might be seen as a setback to the cricket fraternity, but it has also questioned the role of Asian Cricket Council. The trials to select the under-16 boys North Zone soccer team began at the Football Stadium here today. According to Mr Ravinder Talwar, president of the Chandigarh Football Association, players from Delhi, J&K, Uttaranchal, Punjab, Haryana and UP will be taking part in these trials which will continue upto February 20. The 12th annual athletic meet of Baba Banda Singh Bahadur Engineering College, Fatehgarh Sahib, would be inaugurated tomorrow by DIG, Patiala range, Iqbalpreet Singh Sahota. The annual athletics meet of the Homoeopathic Medical College and Hospital, Sector 26, Chandigarh will be held at the Sports Complex on tomorrow. Two HUDA officials were placed under suspension today. They have allegedly been accused of demanding graft after fabricating dues to be recovered from a showroom owner in Sector 11. Five municipal councillors have been made associate members of the 12-member Delimitation Board constituted by the Governor for the purpose of delimitation of the municipal wards in the town.